2. Not buy tickets to a Broadway show and realize it was closed recently because of it’s ‘lackluster’ performance. Oops-dammit, just happened. 3. 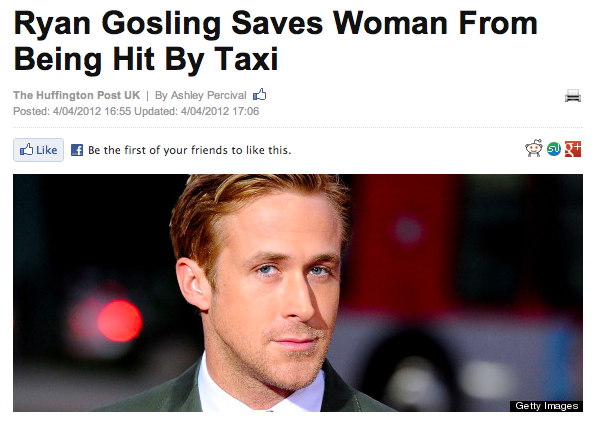 Find Ryan Gosling. Which I know will require me falling into oncoming traffic with a box of kittens and/or old ladies or starting fights with local gangsta’s. 4. Watch someone piss in or near the subway. 5. Reenact the ‘coke’ scene in GIRLS. 6. Find a club with a really long line and cut. Because obviously, I’m on the list. 7. See where Kevin McCallister escaped the cooky bandits in Central Park during Home Alone 2: Lost in New York City. 8.Eat a hotdog from a street vendor and NOT get sick. 9. Find and then piss off Amanda Bynes. Lets be honest-we are all hoping for a Britney Spears circa 2007 meltdown. And I want to be part of it. 10. Visit the Ghostbusters firehouse. Bill Murray, duh. 11. Find the famous restaurant in Seinfeld and order ‘the big salad‘. 12. Buy a pair of Manolo Blahnik’s and drink cosmos with my three best friends: Miranda, Charlotte and the slutty one. 13. Not get robbed or knifed. 14. Refrain from singing New York, New York by Frank Sinatra. Every three minutes. 15. Bump into someone and say ‘hey watch it buddy’-just like in the movies.